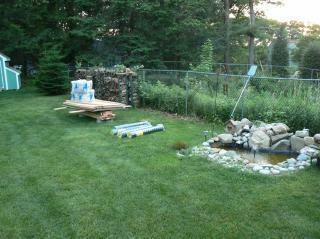 Once upon a time, there was a lush green backyard, but it was a quiet space w/ only a fishey pond....it needs some chickens! 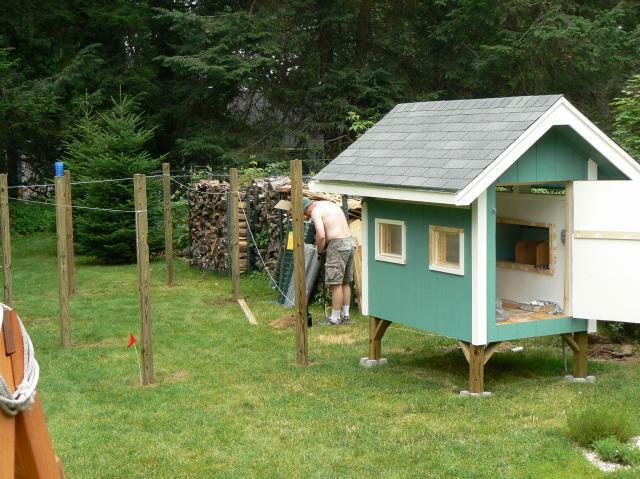 But 1st, a coop! 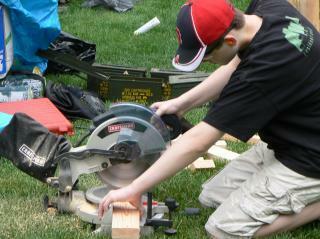 So here we have our trusty handy man, Dave, aka, DH. 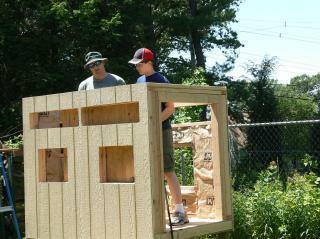 The base is 4'x6', 18" off the ground, & insulated w/ R13. 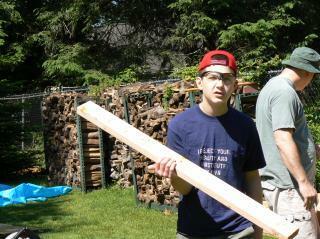 W/ trusty sidekick Jake, aka, DS, measure twice & cut once was the motto of the day. DS making sure things are plumb. Windows, vents, & popdoor. 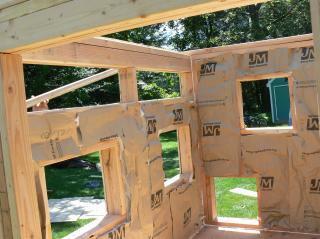 Walls are insulated w/ R13. It's comming along nicely. 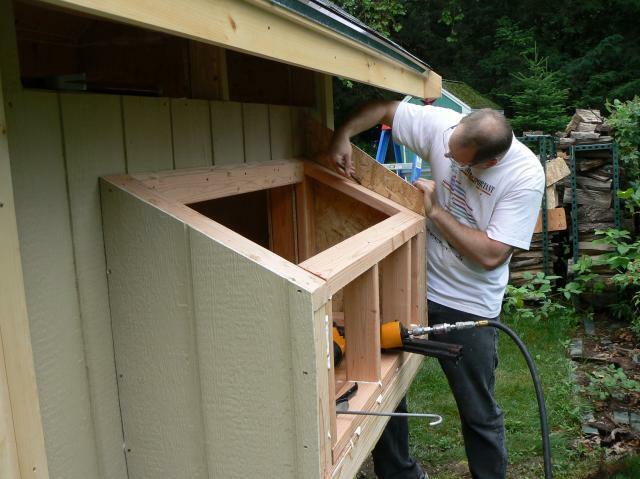 The nestboxes are in & doors are hung. Time for some paint! 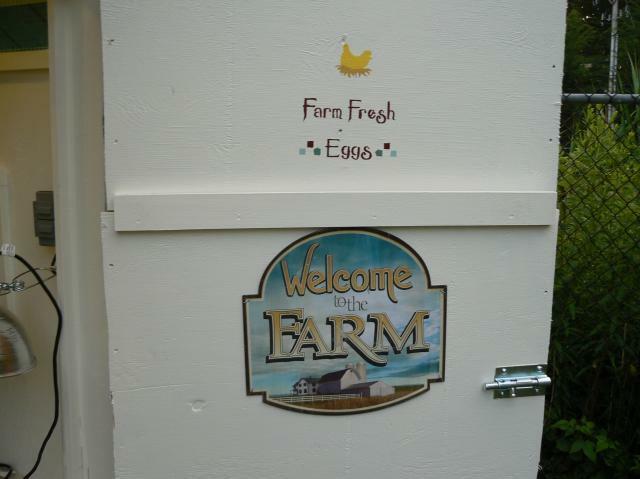 The coop is all painted up, it even has stencils on the inside. This one is above the nest boxes. Can't leave out the ceiling! 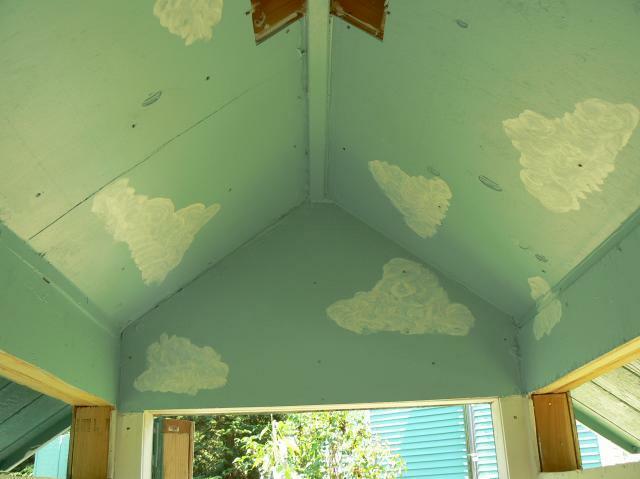 Yes I painted clouds on a sky blue ceiling. Those men in the white coats are gonna take me away for sure! Framing up the run. It is 25' x12', covered in 2"x3" welded wire, which is buried under sod 18"-24" apron style & w/ hardware cloth on the bottom 3'. 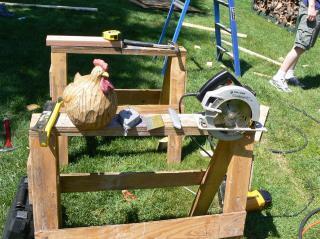 Nothins' gettin' in w/out wire cutters!! All decked out & ready for the girls to move in! There is a removable screen made out of aluminum frame & hardware cloth for added ventilation. I wouldn't consider it predator proof, so I take it out every night, & close & lock the top door. Here they are! All moved in, about 6.5 weeks old in this picture. Ok, there is alot in this picture. 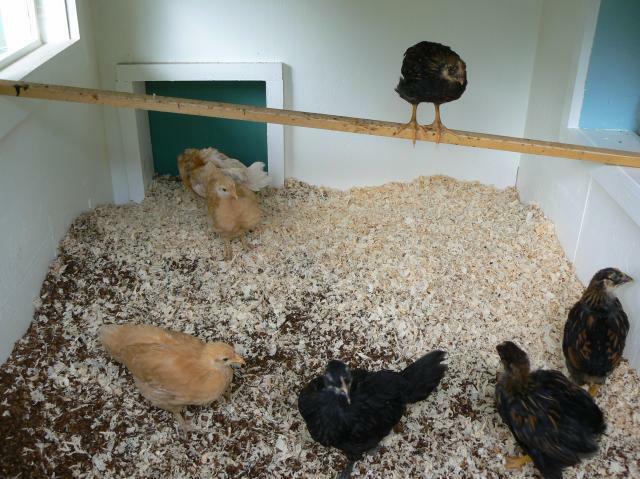 You can see the roost & the poop board. 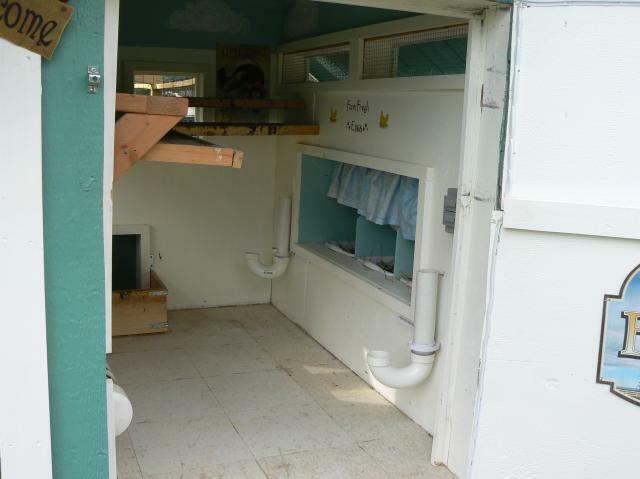 The nest boxes w/ the curtains to keep any draft off their backs when the egg collection door is opened. The 2 pvc J things holds their grit & their oyster shells. 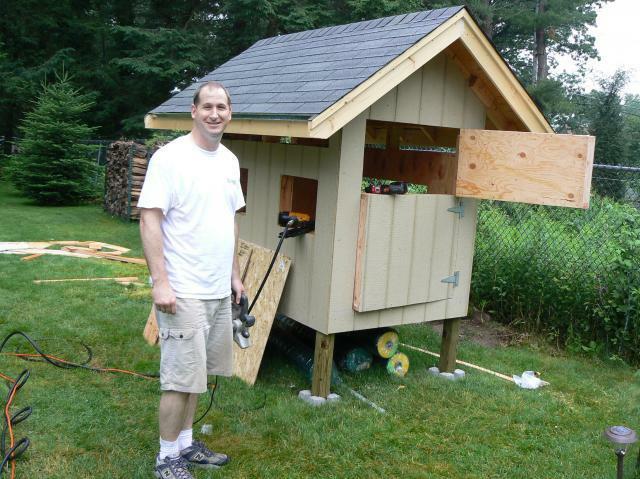 The popdoor( mid- left) has a wooden guard to keep the shavings IN the coop & not out in the run. I guess you can't see the feeder very well, it's that piece of PVC in the lower left. Their H2O sits up on bricks to keep it clean. 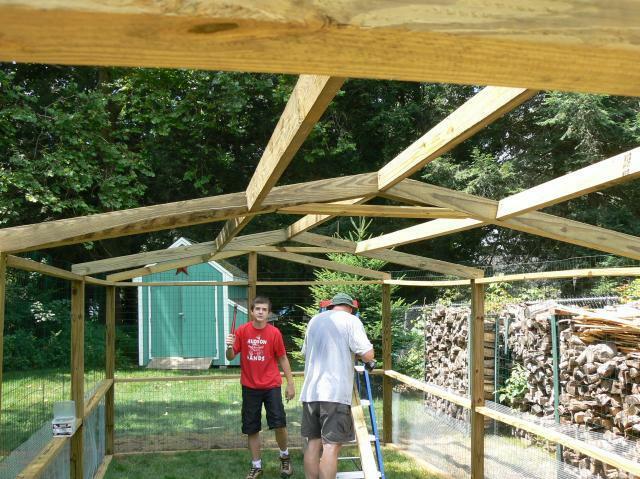 This is the most recent picture of the coop after its cleanout this past weekend. 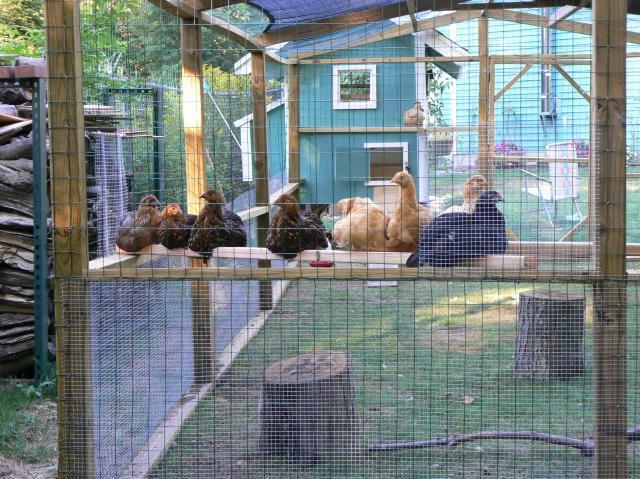 Here's the lucky ladies who get to call this coop home. Hanging out in their run on thier perch. Waiting for a treat or for someone to open the door so they can free range. 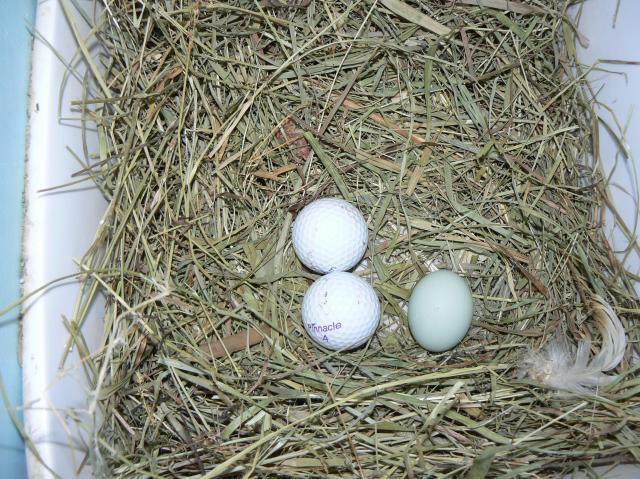 Not only did I get a first egg, I got two in one day! So two 1st eggs! Yippee!!!! 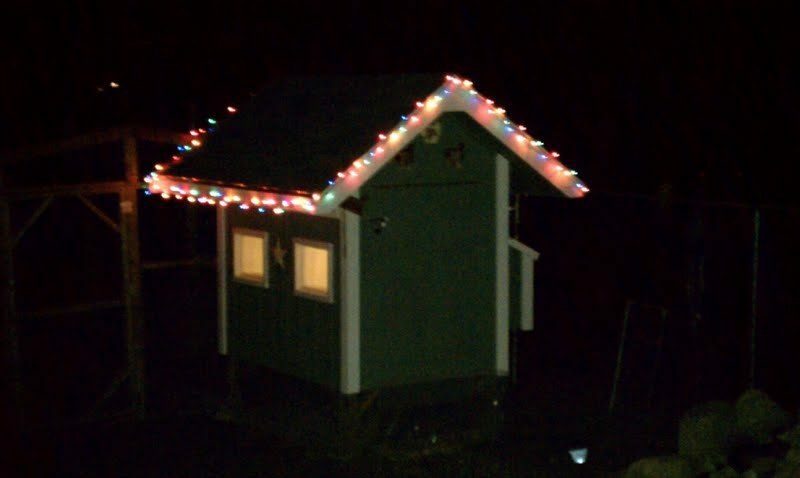 Here's the coop w/ the Christmas lights! 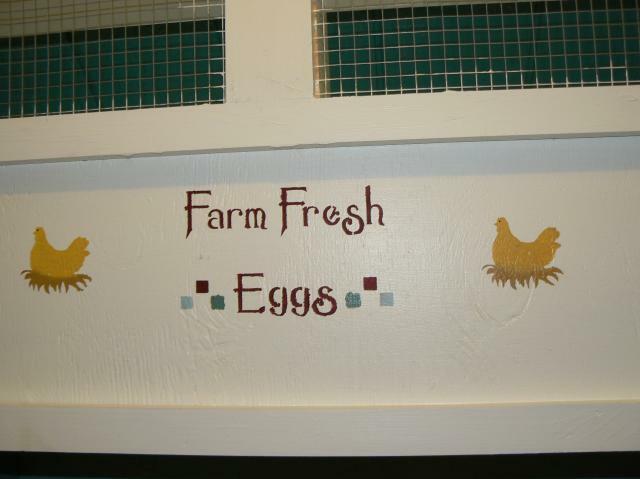 So that is our adventure into chicken farmers. 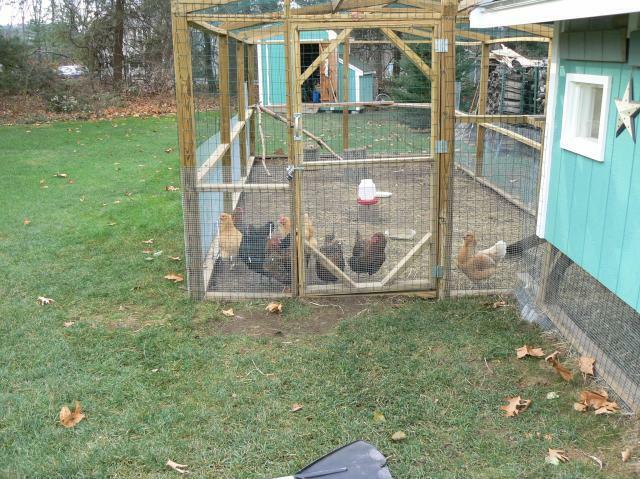 This will be our 1st winter w/ the girls, who are now almost 6 months old. 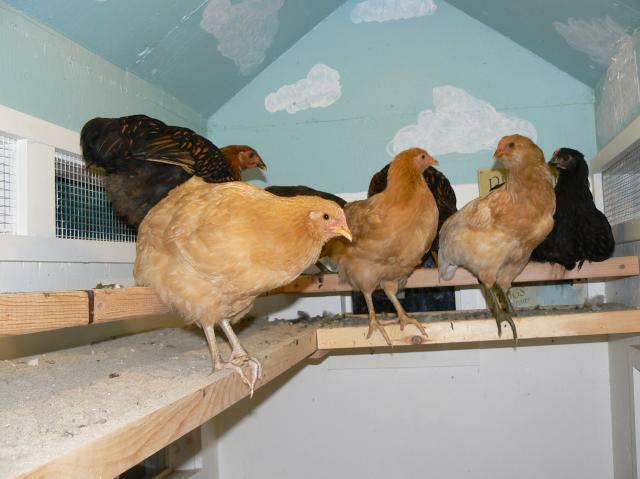 Most of the girls are laying eggs, but not all as of yet. We are trying some 6mm plastic on the roof of the run & along the north & west side. 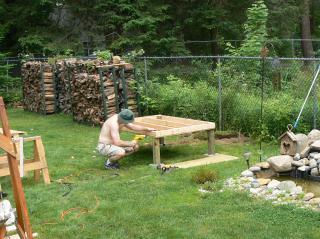 We'll see if it withstands the brutal New England winters we get here. Stay tuned! 12Chicksand1Lady, N F C and lifeonblueberryhill like this. 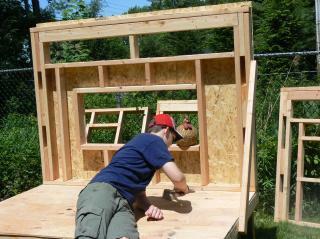 Fun to read article, good photos and a pleasing end result to the coop build! 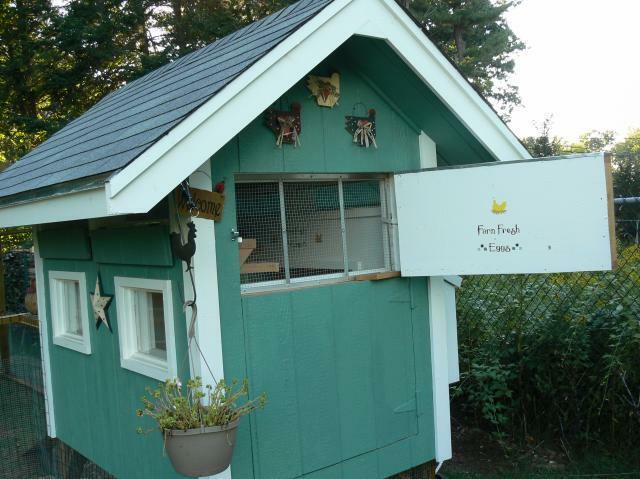 Cute coop and adorable hens! 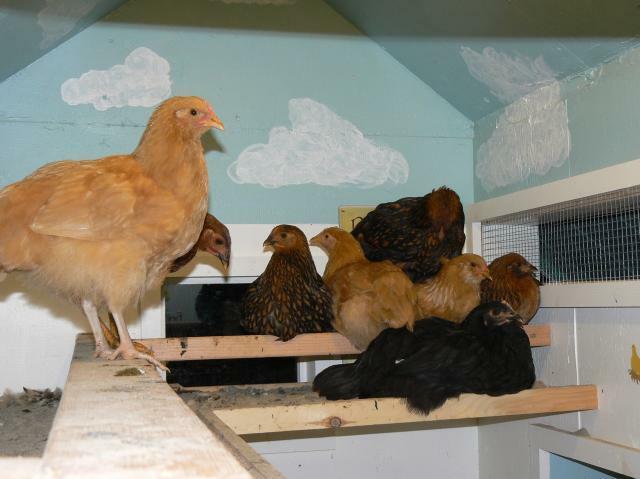 We JUST added an addition onto our chicken run---Before I read this I decided to paint the ceiling pale blue with clouds. 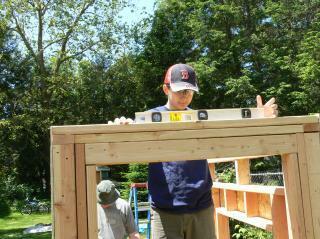 the joists will be the brown of the coop and run and will frame it giving a look of a skylight. After seeing your lovely photos, I am most definitely going ahead with my own 'sky ceiling'! Nice job! 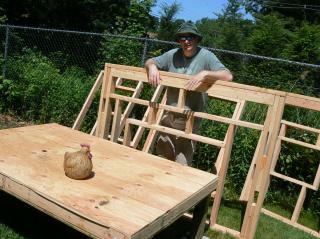 We just built a coop and run in south NJ but I haven't had time to write the story. Enjoyed your narrative very much and I got some terrific ideas. 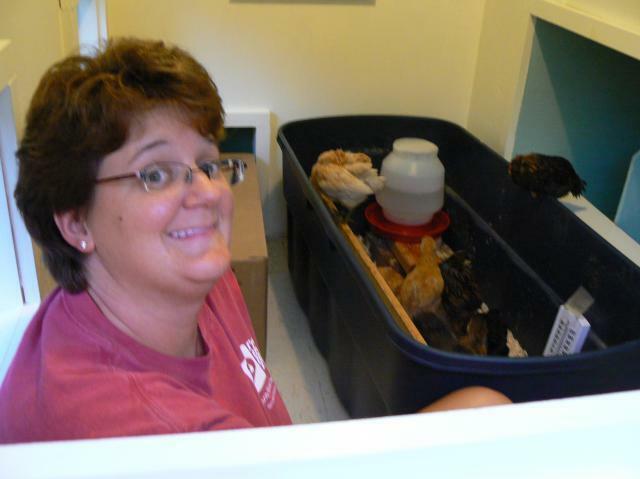 Love your coop and story! Gorgeous. Love it. 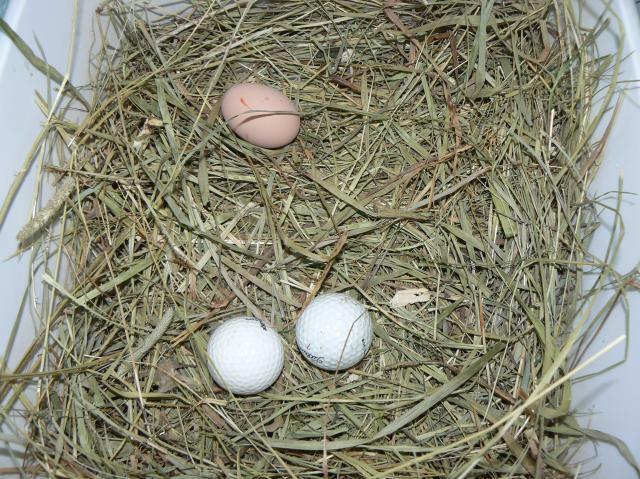 Congrats on the build and your first eggs. This is insanely adorable! Nice job!